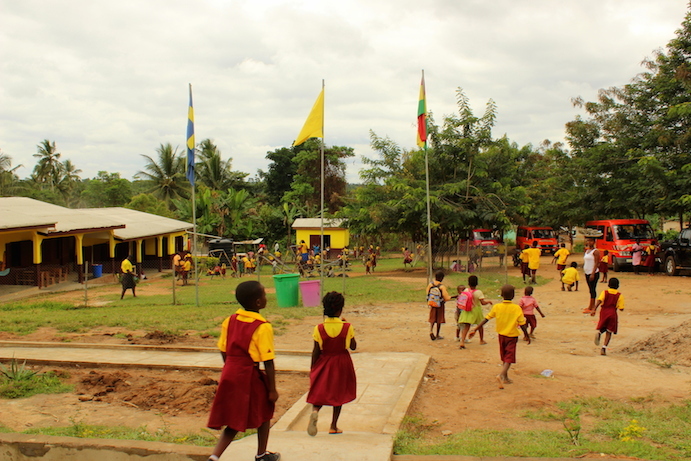 Royal Best Hope School is a private school located in the small village of Oboyambo out in the Ghanaian countryside. The build-up of the school started in 2010 with funds from an international aid organization, but was never built finished and therefore the school operations never took off in a good way. Three classrooms were completed which were intended for the youngest children, nursery and kindergarten. With 212 students enrolled in school, the few teachers did the best they could to teach from nursery up to grade 9 (in Ghana it is called Preschool, Primary School and Junior High School). Due to lack of space, most of the teaching took place outdoors, which meant that the school had to close during the rainy season. Since there are no other schools nearby, there were a huge number of children standing in line to get started. In the summer of 2014 Together as One took over the management of the school and began building the new school buildings. 12 classrooms are now complete, along with library, computer lab and offices. The fact that we chose to build a school far out in the countryside in a small village is based on the idea that all children have the right to go to school. We want to give children who otherwise would never have had the chance, either financially or due to the distance to school, to go to a school with quality education which a school with our standards offers. We are classified as one of the best schools in southern Ghana. This is based on the premises, teachers, educational material, practical teaching such as a computer lab, chemistry / biology equipment, home sience, sports equipment and library, and that we offer study visits for the students. Many schools, especially the municipality schools, have major problems with teachers not showing up, there are no text books, some classrooms hardly have walls and ceilings and that all teaching is theoretical. Try to learn how a computer works when you have never seen one. Physical punishment is common, which is not allowed in our school. The distances are long between the villages out in the countryside and many children do not go to school because it is too far to walk to the nearest school. Thanks to our three school buses, we can now offer our students a safe and easy way to get to school. We can offer many children who have not previously been able to attend school to get the opportunity to education. Since we took over the school, thanks to the new classrooms and school buses, we have so far been able to give a total of 480 students the opportunity to good education. Our vision is to become the best school and offer good education for as many children as possible!